Plans to expand a mosque topped off with a dome will not be enough to fulfill demand, fear neighbouring residents. 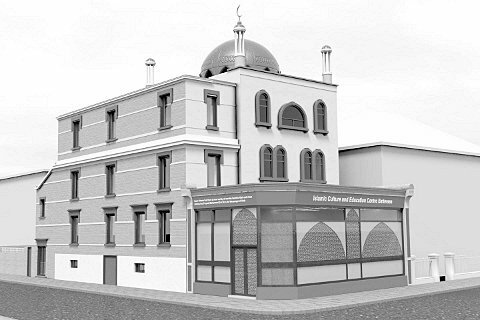 The trust in charge of the Battersea Mosque, in Falcon Road, Battersea, want to extend worship areas and create a dome with a pinnacle. The planning application also describes excavation to the basement for additional prayer rooms, new staircases and a new disabled lift. The proposed Mosque will measure 777 sq m, which will expand the floor area by 44 per cent. Sometimes there are up to 400 men at a time using the building, while women use the adjacent Islamic Culture and Education Centre for worship. Critics fear the building, which was originally a house, is far too small for the numbers of worshippers already visiting the mosque. Cyril Richert, of the Clapham Junction Action Group, said: “My view is a mosque with a dome, some minarets, is perfectly fine and is good to characterise the building. “But you can imagine something like that with a big area on some greenery and some trees like other churches in the area. Liz Walton, chairman of the Battersea Society, said it would be more suitable for the Mosque to find a larger property in Battersea. She said: “The real problem is that the use of the Mosque has outgrown the suitability of this site as a place of worship and community activity for the numbers now attending. A planning applications committee is expected to make a decision on April 11. The planning application has been refused by Wandsworth Council, as reported in our article HERE. This entry was posted in Clapham Junction, In the press by Cyril Richert. Bookmark the permalink.